Just an email to let you know that we bought a katkabin at the weekend and our two cats love it. They both fit in well considering they are two big male cats. I will be definately recommending the katkabin to family and friends. Congratulations on a fantastic product. 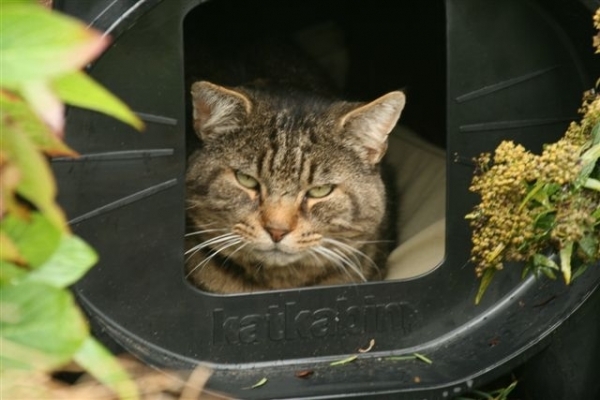 We bought a KatKabin only three days ago to hopefully offer outdoor shelter for a neighbourhood cat who chooses to not go home. We dreaded the long winter ahead for her and hoped the house would provide shelter. Beyond our wildest expectation...she was in it within minutes and instantly took to it. KatKabin is her place of refuge from the rain and cold, a cosy place for an afternoon catnap, her own little sanctuary. She loves it. And so do we. Just ordered the winter liner for extra warmth. Katkabin is purr-fect. My cat had always been a homebody, and even in the summer wouldn't like to stay out in the garden for long unless someone would stay out with her. We always thought this was a shame so decided to try and find some kind of cat kennel for her. 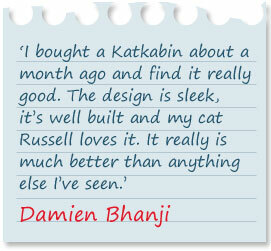 KatKabin stood out as the best quality and value, and as soon as it arrived we knew we'd made the right decision. Our cat took it straight away, spending even more time in there than the house at first! Now she can't wait to go outside to play and relax as she knows that she has her very own safe and comfortable space where she can come and go as she pleases. I would definitely recommend the KatKabin to anyone with cats. I would just like to thank you for the fast and efficient service you have given. 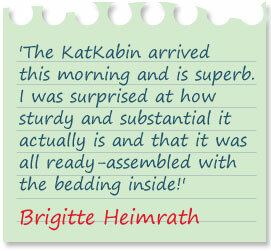 The Katkabin is fantastic - I am delighted with the product. My cat is loving his KatKabin right now because of the cold and rain. By the way, my little cat is a feral and it only took him 3 days to trust that this was the best home he has ever had! I have the KatKabin on our front porch in plain sight and he still uses it! I guess he knows a good thing when he sees it. :o) If we are able to get a photo one day, I will definitely send it to your company! Thank you so much KatKabin!!! Midnite thanks you as well! I'm living in Belgium and as we have "second hand weather of Britain" over here, Nakske the stray cat loves the KatKabin, he was very shy and a bit of a loner and I was't convinced he will use the KatKabin, but boy was I wrong, He just loves this cosy and warm shelter, he's not so shy anymore and we even can caress him, that was unthinkable when he was living in the "wild". He finally found a home and is very welcome. Ayrton & Talullah just love their Kat Kabins Dez Rez as it means they can play outside all day and still have a little place to rest. Often I find them asleep inside when I come home from work. I was very impressed the winter liner was posted to my BFPO address and arrived within one week - they can now keep toasty on the cooler days! I just wanted to let you know that I am using your product not for a cat but in fact for my rabbits. They stay out in the winter and the KatKabin makes a fantastic additional to their outdoor run. I have been looking for something like this for ages! My rabbits are cozy for the winter - Thanks. This is a brilliant item. My cat loves it, she is warm and dry whatever the weather and I can be out with peace of mind knowing she is safe and dry. Great for summer too. Wouldn't be without it! 'Guinness used to live next door to us 2 years ago. His owners moved from the countryside down into the market town. It took us all about 3 days to capture him as he just didn't want to leave. Eventually we caught him, he was taken to his new home and lived there with no problems. Then Guinness's owners announced that they were going to try and emigrate to Canada - but they weren't taking the cats. The farmer at the top of the garden was took on the cats - apparently Tiggy has settled (in the barn on the farm!) but Guinness didn't. He knew me straight away and every night I'd come home and he'd be in the garden sunning himself waiting to be fed. The farmers wife had said to me that she never sees Guinness anymore, so I began the search for a house for him - the sheds are too cold being made of timber not brick. I found the KatKabin, purchased it about 3 weeks ago and have set it up near the back door. Every day I've been checking to see if Guinness has been in, even putting treaties in the back hoping he'd go in. Yesterday - I walked down the garden home from work there was no Guinness on the lawn, no Guinness by the back door - but guess who was in his KatKabin! We bought our KatKabin yesterday and one of our cats is permantely in it. Vader loves is although his sister Winter will prob try to sneak in to join him when we are not looking! I just wanted to let you know I placed an order and received the items this week! They were posted to a BFPO address and arrived in good time - it took 1 week which is normal for BFPO. 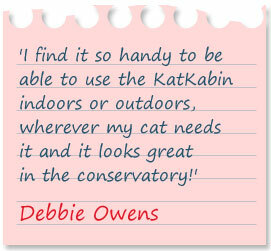 Thanks again & the cats are now even happier with their KatKabins as they are very toasty!